Around this time of year, I usually post some gift picks. As I always say, giving a gift isn't that hard if you pay attention. But I noticed, reviewing past posts, that I tend toward the beautiful and luxurious, even if it's a bar of soap. I could lighten up. I don't intend to give cheap gag gifts—an egregious waste of money—but a gift with wit, to order forthwith. One of my sons got this last year from his MIL and I thought it was a hoot: Kilt bath towel, $26 from fruugo. Available in various tartans in case you have a bunch of laddies in your loo. 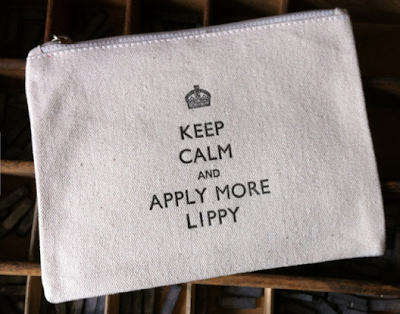 For your girls, a small makeup bag, price about $8 from Etsy seller LittleRedPressLondon. 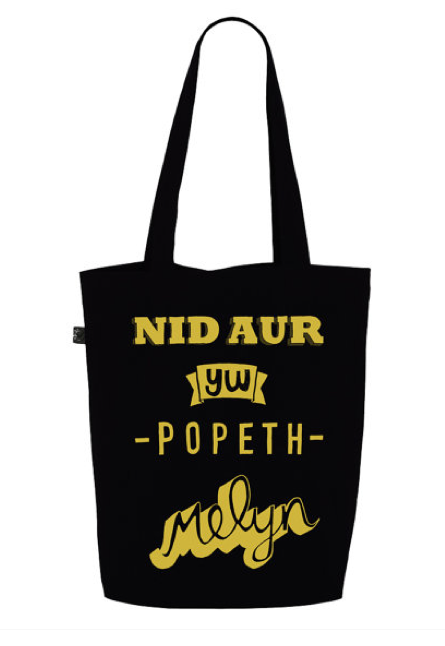 Totes: useful for the market, books, and storage. "All that glitters is not gold", in Welsh, on a black canvas tote. About $14 (plus shipping) from PerisandCorr. 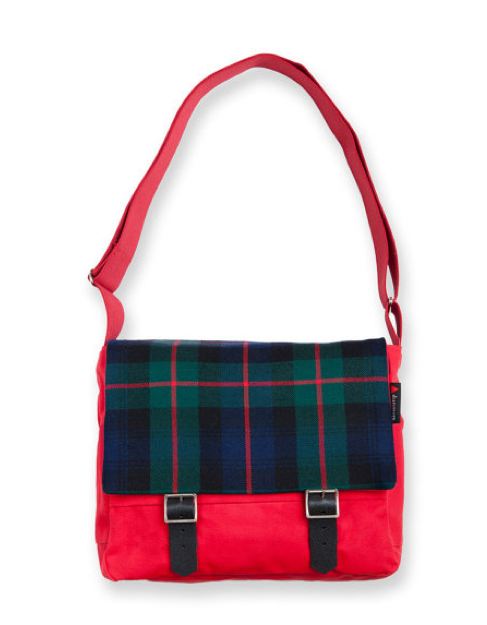 For a significant gift, upgrade to the jaunty Strathtay messenger bag in red canvas and Harris Tweed tartan, from Dunmore Scotland, about $195. A tea cosy with a hedgehog peaking over the edge: who can resist? Handmade by Etsy seller CrystalMoonCat, about $51. Check her site to see more delightful critters. 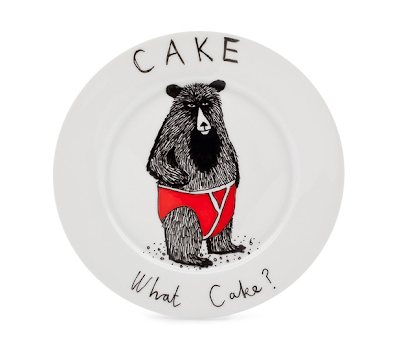 This particular plate (price, £25) is sold out, though you can contact Wolf and Badger for orders or choose other JimBob Art pieces. Can't resist throwing in one special piece. Isn't "Hooray!" a quintessential English expression? 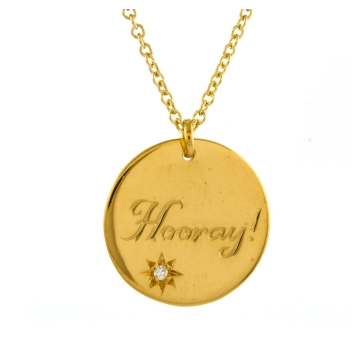 24k gold plate disk necklace with 1mm diamond (also available in silver), £180 from Alex Monroe. London jeweler Alex Monroe's pieces have long combined whimsy with grace; see more of his work here. Don't miss the "Love Actually" locket, a fetching gift for a young-adult daughter or a fan of one of my favourite-ever seasonal movies. The season will be upon us before too long! Isn't etsy a fabulous source for finding the beautiful and unique? It amazes me how many creative artists we have to choose gifts from, and shopping online is so easy. I do like to wander about into our local gallery shops though and get some exercise while shopping. Plus now I have the time to explore them. Enjoy your gift shopping Duchesse! I cannot resist the hedgehog, what perfect winter warmer. oh that hedgehog tea cosey just melts my heart. I am English and twice a day make my brew in a tea pot, which is currently warmed by a defunct Astrakhan hat of my grandmother's which she purchased in the Crimea in the '20s. This would be much smarter on the breakfast table. Having tea in my office between classes, a bit discouraged by the current state of my students' work (ethic) -- and you cheered me right up with this post! 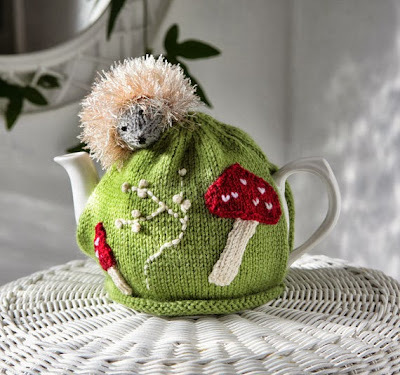 And made me think I need to make a tea cozy or two, and make sure to knit some wit and whimsy into them . . .that hedgehog is brilliant! He'd make me smile every single day! Nice picks! I was in Edinburgh and avoided all the tacky tourist shops, but actually there were probably some gems like that cute kilt towel. England does have such excellent gifts - from the little shops at cathedrals and stately homes and other attractions to just little shops on the high street or some things from chain stores like cute socks with animals on the toes from Accessorize. Also, there are excellent regular craft markets. We're really spoilt for choice when it comes to Christmas shopping - my only problem is finding things light enough to send overseas.